It would be an understatement to say that I was excited to try Relish. 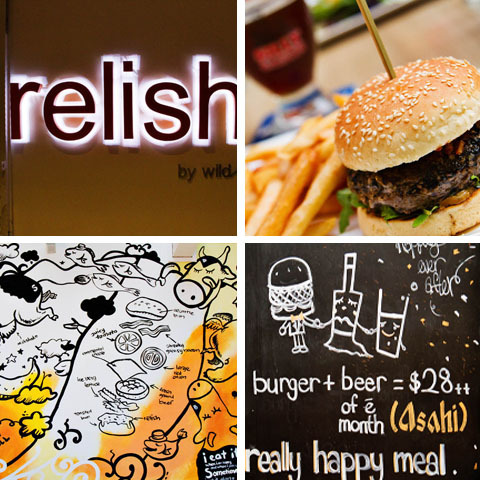 I’ve been on an epic odyssey a search for my favorite burger in Singapore since arriving. 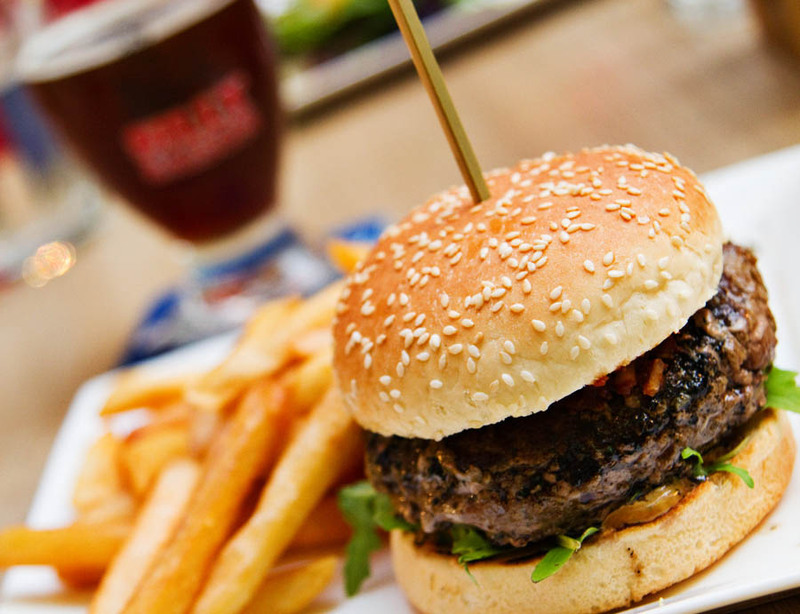 Here was a whole restaurant devoted solely to the glorious hamburger in all its incarnations… not only that, but the burgers are individually paired with Belgian beers. 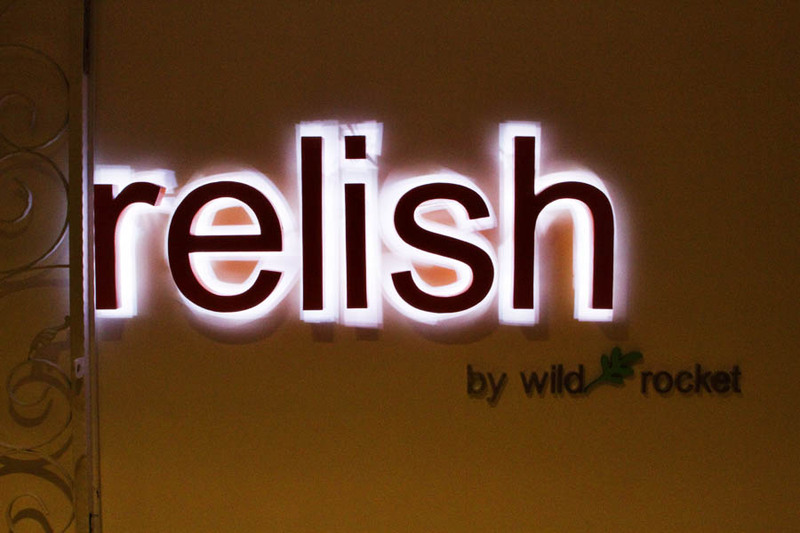 It seemed like an instant recipe for success….We arrived to find Relish, not surprisingly for Singapore, in a shopping center. I still don’t like it, but I’m getting used to dining in malls and shopping centers so my spirits remained up. The interior was modern, clean and fun thanks to the playfully illustrated walls… though to me a bit dark and moody for a burger joint. 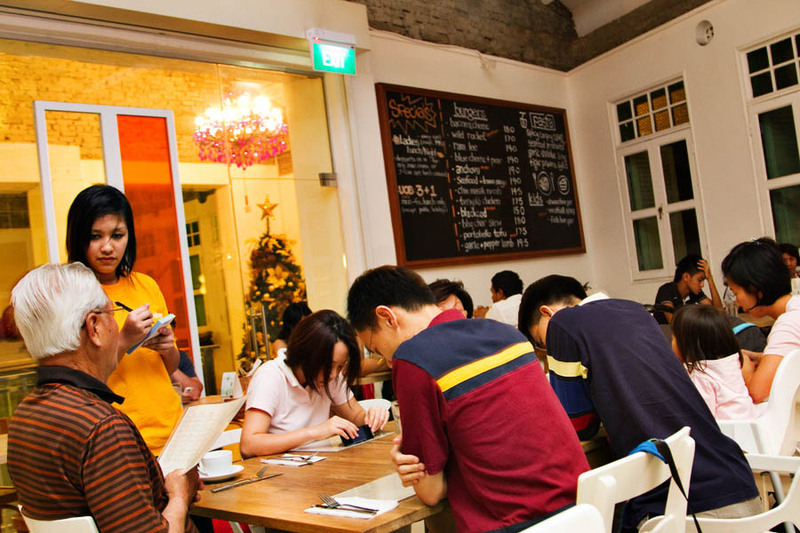 There are the “Singapore modern restaurant” obligatory chalkboards with handwritten specials, drawings, etc. 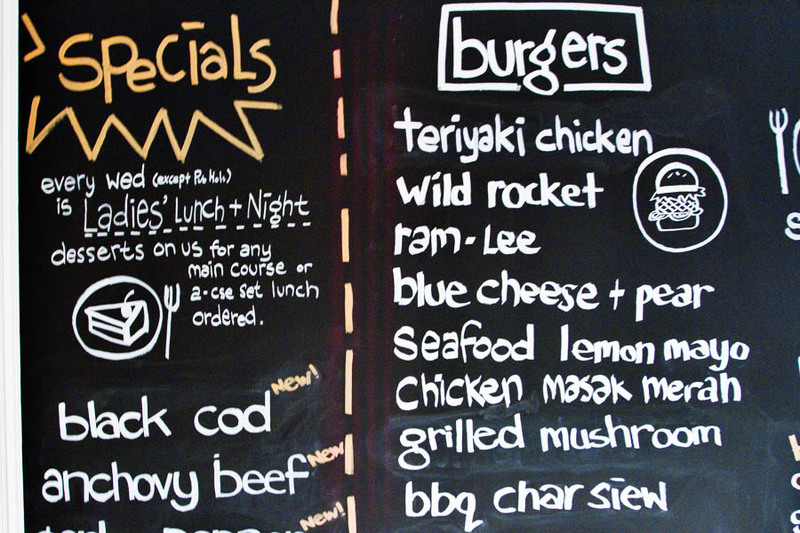 In my opinion the chalkboard motif is a bit played out in Singapore these days, but it fits for a burger place and worked well in this space. The menu was exciting and fresh. It was minimal, focusing on the mighty burger and not much else. I prefer a place with focus… if you can’t do one thing really well, why try to do 4 or 5? There were regular burgers, seafood burgers, lamb burgers, BBQ Char Siau Pork Burgers, and other interpretations. I was here looking for a great classic burger so asked the server for her recommendation and was told the signature burger was the Wild Rocket Beef Burger with arugala, sarawak pepper cream, and sundried tomato relish (SGD 18 for 180G). 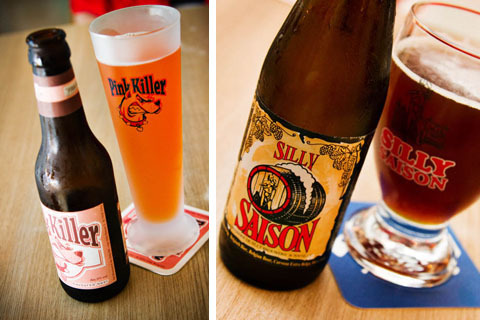 I also decided to test out their beer pairings and so went with the recommended Saison Silly Belgian Ale (SGD 13). The burger came in a bit smaller than I was anticipating after the monstrous 200G Sunshine Cafe burger. The burger was good but not great. Most of the flavor came from the sauces and the meat itself was a bit mushy and under-seasoned. A quick note on the beer. While I do like the clever packaging, colors and naming… it seems more like novelty Belgian beer that you’d never find locals drinking in Belgium. The beer bottles reminded me of the tourist hot sauce for sale near the town square in Santa Fe, New Mexico… the stuff a local wouldn’t be caught dead using. It had the basic notes and represented the style it was supposed to be but wasn’t the quality I expect from a 13 dollar Belgian beer. I think I’ll stick to the “local” beers in the future and go for Rochefort 10 or others when wanting a solid Belgian. Joanna was wanting to go healthy that night and opted instead for a great sounding Grilled Portabello Tofu Burger with honey mustard sauce, caramelized onions, and spinach – with salad instead of fries. Another good but not great “burger”. Portabellos have a lot of inherent flavor potential and so she was surprised to have a rather bland tasting burger. 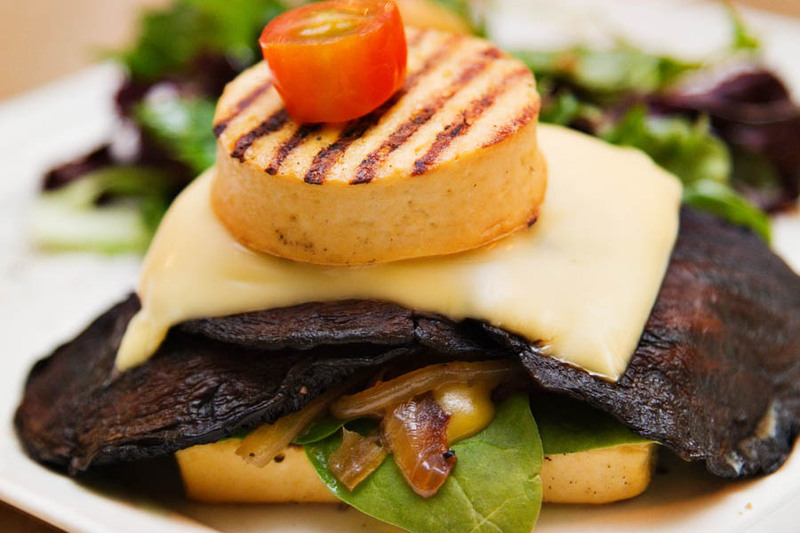 As one of the only vegetarian options on the menu you’d expect this burger to really bring it in terms of taste… unfortunately for any diners not wanting meat, this isn’t really the case. So our first visit left a bit to be desired. 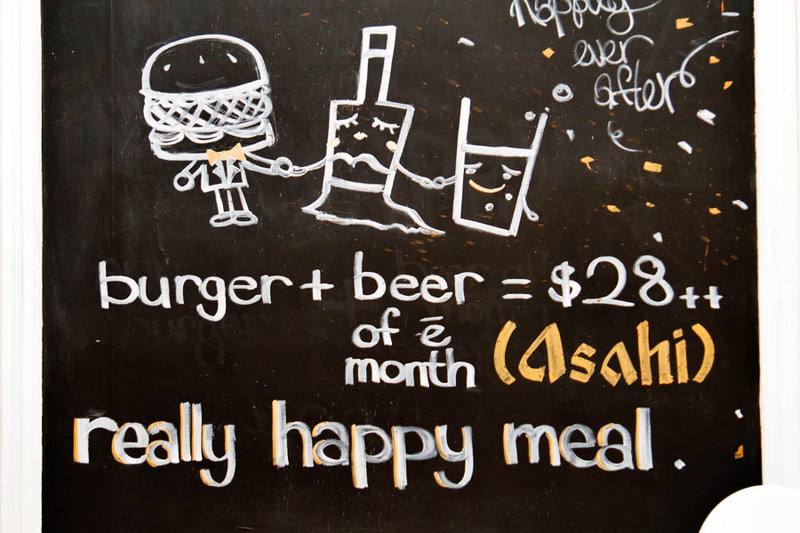 It was great seeing sub-30 dollar gourmet burgers in Singapore (the norm it seems when out on Dempsey Hill) but when you add any of the suggested drink pairings you’re immediately up in that territory again. The burgers were a bit above average for Singapore… but I don’t see us rushing to return again soon. I’ve had worse burgers in Singapore with much higher ticket prices so it’s by no means a failure, but unfortunately my quest for the best burger continues. nice! i’ve managed to catch the Sunshine Cafe burger on their closing day, and like you also on the lookout for a great burger. Thanks for sharing! I will try out this place soon, maybe the other burgers so everybody knows what everything tastes like! keep up all the posts! i enjoying reading them! I agree that the beef burgers can be better, but the Char Siew Pork burger is melt in your mouth and really to die for! Will have to go back and try that one Christine. I actually was wanting to try some of the odder sounding burgers on the menu, but figured I should do their “signature”. Maybe a trip back soon for the lamb or Char Siew…. I hate to admit I still haven’t had any version of the Char Siew since living in Singapore. Need to put that high up on the list of things to do soon! where is the best burger so far? I had a great burger this weekend at Breko (Holland Village). Thanks for the tip Marc, will have to go check it out soon. Mike, we should have a full burger roundup coming shortly! Now their burgers need to get bigger. BIGGER!!! char siew rocks my belly. truly awesome stuff. Paul – sunshine burger is back, now called de burg, at 10 ghim moh road. Stall 2.